Day 11: Butte, Montana -254 miles; Trip Miles – 3947; A River Runs Throw It; Maloney’s Bar; The Irish in Butte. 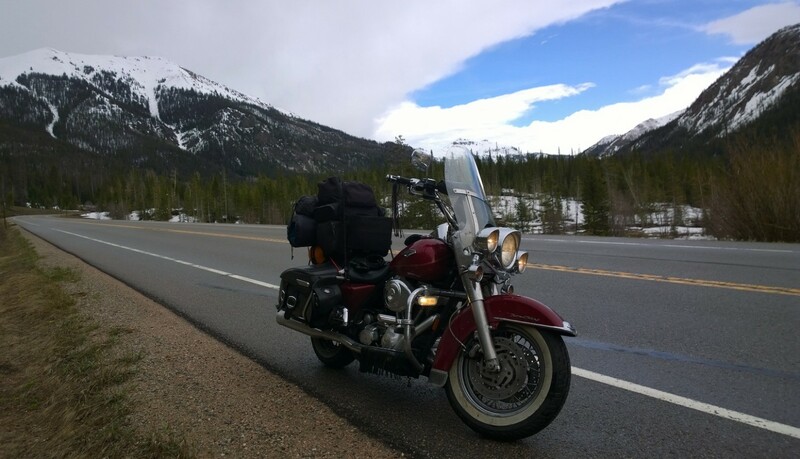 I was thinking a lot about that book as I rode through the beautiful landscape of Montana. Mountains- some still snow covered, rolling hills, green fields, spruce and fir trees and a glistening, sparkling river snaking its way with me along the road. It was magnificent. I landed reasonably early at another Motel 6 in Butte’s uptown. Time enough to wash my clothes, do a little research on Butte, and then head out to walk a little of the uptown section. I knew the town had a sizable population that defined itself as Irish but I was shocked to read that in the 2010 Census it was named as the most Irish American city in the country with 23.6% of the population identifying their roots as Irish. Apparently, they came over during the years 1845 -1855 when Ireland was experiencing its famine years and went to work in the mines. This immigration went a large way to explain why there were so many shamrocks around and Irish named bars. I chose to go down to Maloney’s, one of the oldest, founded in 1871. It was easily identifiable outside as having a big green and white stripped awning and a glowing shamrock embedded in the concrete at the entrance. Inside was a long bar and no tables, with a juke box, and some electronic gaming machines along the wall. The tap had many of the usual beers, along with Guinness, and Irish Death, and a Haybag HefeWeizen which I enjoyed. There were the usual shamrocks, maps and flags of Ireland but then it became more Montana – like. The walls were adorned with beer signs, antlers, a boar’s head and a moose head. Cans of Lucky Lager sat on a shelf. A rifle with a scope hung over the bar. But it was the people that I enjoyed the most. The friendliest and strangest I’d met so far on this trip. Four women were giggling and playing the longest pool game I’d ever seen. A guy watching them said when they finished: “I don’t think you’ll have time for another. The bar closes in four hours.” He introduced himself to me and spoke of living in Arizona and riding his motorcycle down there. But he moved back home because he loved it here. He was running a bar down the street and said: “Welcome to Butte, Monk.”. (My road name.) Then there were three wacky people, two women and a man, who sat beside me, said hello and introduced themselves. The man was from Minnesota, and one of the women said she was from Fargo. The two women started elongating their words striking some attempt to be funny and sound like they had a Midwest accent. They were constantly joking and soon confessed that they were just making stuff up. Then we had a bit more of an honest conversation, at least I think so. They welcomed me to Butte too and left after a while. Then there were others and the bartender and a man beside me named Kevin who kept muttering: “Oh Jesus, Oh Jesus”. ← Day 11: Pocatello to Dubois, Idaho – 100 miles (so far); Happy Birthday Walker Percy; Man with a Sign on the Corner; Brian; Blessings. Traveling mercies and blessings Gene. I’m in Billings where my older son, daughter in law, and newly arrived twin grandchildren (Alice and Jack) live. Hope you are well.